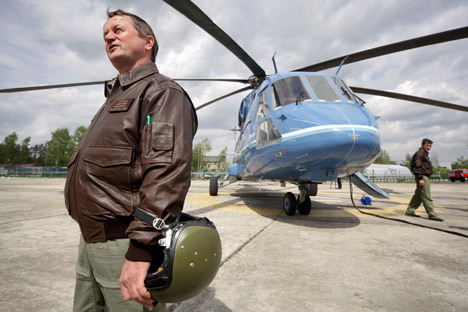 Russia’s aviation sector looks forward to long-awaited helicopter repairs and reinforcements. Russia’s Deputy Minister of Industry and Trade, Yuri Slyusar, recently announced that the state program for the promotion of the aviation industry was approved by the government in November and will be adopted by the end of the year. “The program incorporates a separate sub-program for the development of the helicopter industry, which envisions some 60 billion rubles (around $2 billion) in investments, including 36.5 billion rubles ($1.2 billion) to be provided from the state budget,” said Slyusar. The Ka-60 has a maximum speed of 186 miles per hour and a range of 478 miles. It has a capacity of up to 14 troopers or 6,172 pounds. According to the minister, the program will involve continued financing of the Mi-38 and Ka-62 programs, as well as a number of new projects, which includes the creation of an advanced high-speed helicopter. Logistical centers will be set up at Ramenskoye airfield near Moscow, to ensure fast and efficient maintenance of the new helicopters. The centers will also provide aftersales services for aviation equipment. The Russian air force is expected to receive more than 100 new helicopters by the end of the year. “Army aviation units continue to replace old machines with new and upgraded helicopters, including the Mi-28N, Ka-226, Ansat, Mi-26, Ka-52, Mi-8AMTSh and Mi-8MTV-5,” said air force spokesman Lt. Col. Vladimir Deryabin. He also noted that active repairs are underway for the helicopter fleet currently in use. “More than 80 helicopters will be handed over to air force units,” Deryabin said. Furthermore, new Ansat-U combat trainers have been delivered to the air force, in order to train the new generation of helicopter pilots starting in 2013. The air force will also receive new transport and multipurpose helicopters. According to Russian Helicopters general director Dmitry Petrov, the Ministry of Defense has ordered around 100 Ka-60 Kasatka advanced multipurpose military transport helicopters from the company. Furthermore, official Ministry of Defense information reveals that seven Ka-60 helicopters have already been handed over to the air force and are currently undergoing service tests. Kamov has been focusing recently on construction of the Ka-60 and the Ka-62 civil version, Petrov says. Batch production of the Kasatka is expected to begin in 2015. Minister of Industry and Trade, Denis Manturov, has said that Kamov will receive 12.2 billion rubles ($393.9 million) to implement the Ka-60/62 project and build the Mi-38 (a new heavy transport helicopter) in 2011–2013. Russian Helicopters plans to have the Ka-62 certified in 2015-2016, after which the company will begin its deliveries.